WebTight Security™: As Much a Hosting Philosophy as a Service! Innovation, customer service and security have been our mantra since 1997. We understand would-be-hackers rarely take a day off, and with open source scripts like WordPress, Joomla, Magento, Zencart and others becoming more popular it can be difficult to fully secure a website against every possible exploit. *Customer notified and awaiting follow up. 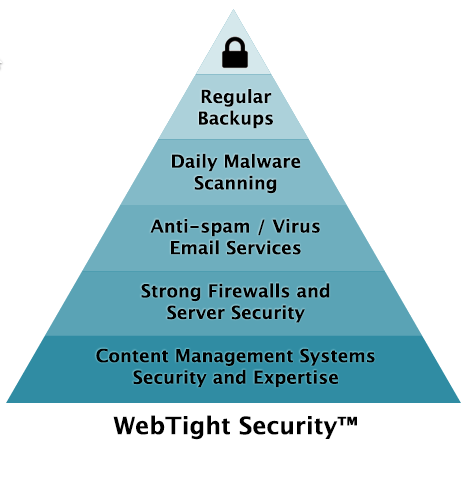 So we coined the term, " WebTight Security™ " to better describe our focus on security and customer service. We believe your web host should be your first line of defense. So many hosts today seem to believe security is the sole responsibility of their clients. We humbly disagree. Web hosts whose idea of server security is to simply turn off or suspend their clients' business websites after identifying malware are simply failing to fulfill their clients' needs. We believe website security should be a team effort, and that shutting a customer's website off at the first sign of malware is simply bad business. We also believe that strong server firewalls, server security, and maintaining a close connection with the open source community, particularly in regard to content management systems like WordPress and Joomla are a day to day responsibility. Our free daily root level malware scans are automated, and both malware and email logs are visually reviewed by our staff daily. If we find a client's website or email account(s) have been compromised we will notify the owner of the site, normally the same day; recommend courses of action to resolve the issue; and even help clean up compromised websites if required. With TVCNet's WebTight Security™ focus your website will be in good hands. "Regular Backups + Daily Malware Scanning + Anti-spam / Virus Email Services + Strong Firewalls and Server Security + Content Management Systems Security and Expertise = WebTight™ Security"
Review some of our customer Service Testimonials . Like someone to manage your WordPress Security and Updates? Clear hacked web pages from your website today.